Thanks to the summery weather of yesterday I wanted nothing but vegetables for dinner. On my walk home from work I broke the cardinal rule of grocery shopping (don’t go hungry!) and popped in the store to pick up some dinner supplies. Everything sounded good! I reminded myself that I was walking and therefore needed to show some restraint but I still ended up with some seriously heavy bags. From store to table in 15 minutes flat! This picture is deceiving but that is actually a small mixing bowl full of salad. Romaine, red peppers, carrots, avocado, feta cheese and my go to agave-Dijon dressing. Quickly sauteed (maybe 5 minutes in the pan?) 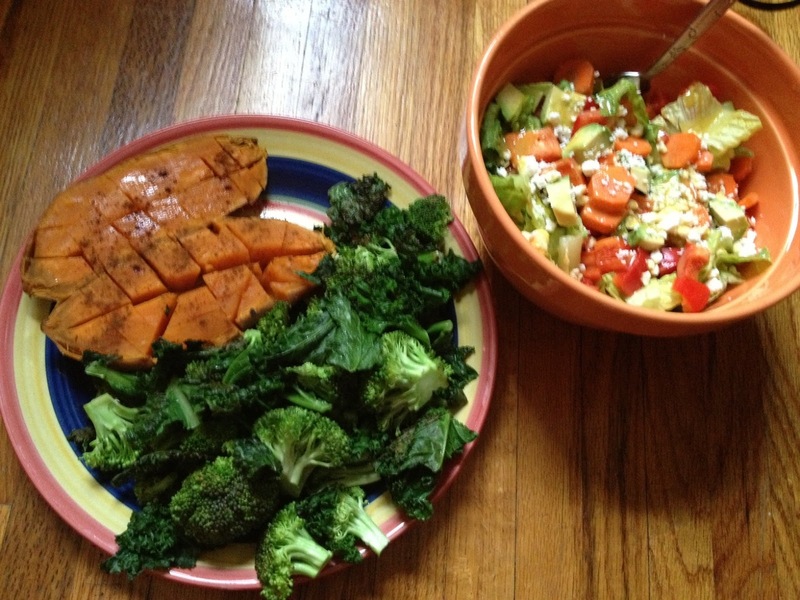 kale + broccoli, with sea salt and lime juice, and a good sized sweet potato with butter and cinnamon. I was so insanely full after eating this (but I was still able to clean my plate 🙂 ). After my dinner of vegetables we headed to a mini cookout with two of our friends. They enjoyed their brats (while I snacked on one too many PopChips) and we started talking about the upcoming duathlon. I haven’t really thought too much about the fact that I don’t even know how a race like this is run. I knew about transition but I didn’t really think about the logistics of it all. This is a relatively small race so we only need to be there 1 hour before the start to get our stuff settled in the transition area. I won’t be wearing cycling shoes to transition for me will literally just be putting on my helmet, switching the Garmin to cycling mode and hopping on my bike. Nice and simple. 1. Drafting can lead to disqualification. You must stay three bike lengths behind the nearest cyclist unless you are actively attempting to overtake them. If you spend too much time within three bike lengths you will receive a time penalty. This makes sense to me but I didn’t know if was an official rule. I’m definitely more nervous about getting into something new than I am about my performance. After looking through some pictures and the results from last year, I know that the trail will be quite muddy (lots of lost shoes!) and I have NO idea what to expect from myself time wise. The fastest female in my age group ran at a 9:46 pace and biked at 15.1 mph, while the slowest ran a 14:50 pace and biked at 10mph. I imagine I’ll fall somewhere in the middle of that but I kind of want to push it hard and be competitive! My running pace will really depend on what the trail is like, obviously. As far as the biking goes I just plan to give it everything I’ve got. I find comfort in the fact that last year’s group wasn’t full of crazy fast girls, I was afraid that I’d be way way back in last place! Any tips for pre-duathlon prep? ← What season is it?!? Just try to see that finish line without breaking any of the rules. Du's are freaking hard. I don't know why they are so much harder than triathlons, but the one I did a couple of years ago just destroyed my will to live. take it easy on the first run, bike like there's nobody else around you, then push that second run with anything you might have left. Ahhh now you have me scared again! I plan to spend most of the first run trying not to sprain/break anything, haha. I'm really hoping I can push it hard on the bike, my last ride had an average of (a slow) 13mph but that was with a few really easy miles while my friend and I were just coasting through and chatting. The last five miles ranged from 14 to 15.5mph so I know I have it in me!